NIAMEY: At least 44 migrants, including women and babies, were found dead after their vehicle broke down in the desert of northern Niger while on the way to Libya, local officials said yesterday. 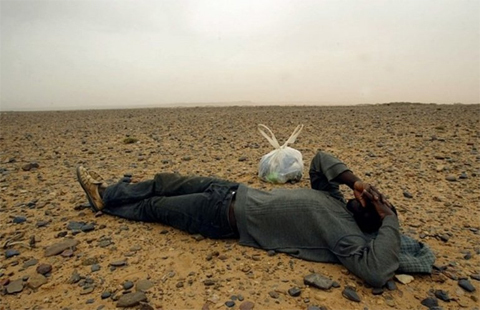 “The number of migrants who died in the desert is 44 for now,” said Rhissa Feltou, the mayor of Agadez, a remote town on the edge of the Sahara that has become the smuggling capital of Africa. Last year, the International Organization for Migration (IOM) recorded 335,000 migrants heading northwards out of Niger. The Red Cross, which said “at least 44 migrants have died”, has dispatched a team to the site “to gather information” on the circumstances. A security source who asked not to be named said “the sub-Saharan migrants, including babies and women, died of thirst because their vehicle broke down”. In early May, eight migrants from Niger, five of them children, were found dead in the desert while on their way to Algeria. Also in May, soldiers on patrol in northern Niger rescued around 40 migrants from various west African countries who had been abandoned in the desert by people-smugglers they had paid to get to Libya. The group included people from The Gambia, Nigeria, Guinea, Senegal and Niger, all of them hoping to reach the Libyan coast and from there cross the Mediterranean to Europe.